Gay van Hasselt has yet again pulled off a remarkable feat. Just eight months after the untimely death of her husband, Gay, who admits that she knew very little about farming angora goats at that time, has walked off with six prestigious awards for her angora goats at the inaugural International Mohair Summit in Graaff Reinet at the beginning of November. 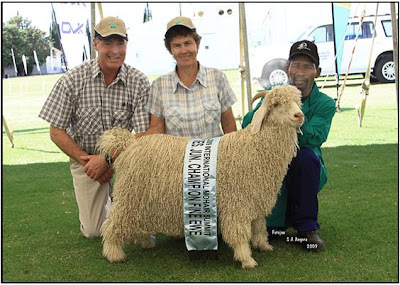 Gay, who boasts numerous local and international awards for her cheeses and Guernsey cattle, lifted the South African Junior Champion Medium Ewe and the Reserve Junior Champion Fine Ewe trophies at the South African Mohair Championships held at the Summit. She also was in the running for the Supreme Animal trophy and was placed in four other classes. She proudly noted that the Supreme Animal award was won by a ram bred by the Grootfontein Agricultural College in Middelburg out of goats from Clive’s stud. “Clive was so in tune with nature, the animals and their needs. He even researched and advised me on the genetics of my Guernsey herd.” Gay said. Gay also had to take over the day-to-day management of their farms, sorting out fencing, machinery and broken windmills, things that she took for granted. “It has been a steep learning curve,” she says with a wry smile. “And I’ve had tremendous support from friends, especially Jan Venter, who shared Clive’s views.” She is determined that nothing will get her down and that empowering her staff and developing their skills is the best way to manage the angora operation. One doubting Thomas has had to apologise to Gay for predicting that she would not be able to keep on both the mohair growing and her renowned Gay’s Dairy. “I am so proud of how well the Dairy staff is running things while I have had to concentrate on other areas. They are a great team.” Would she ever consider returning to public life? Gay ponders this and says that maybe one day when her son, Jordi, takes over the farm and she has the time, it could certainly be a possibility.